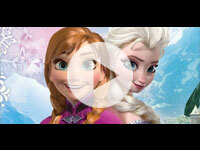 Wanna download this clip or back up DVD Cinderella to PC/TV/Portable Device? In the long growth process, what fairy tales accompany you through the golden childhood? Cinderella must be one of them, I believe. Which fairytale character that you have a passion for? Cinderella must fascinate you, I believe. Cinderella is a legend, rather than a fantasy book, or a figure. It represents the courage, kindness, dream, and the promise of love. It’s a dream every girl having read the story fantasizes about once in a while: one day, you wear the glass shoes in the pumpkin coach, waiting for the Prince's invitation. Now, in 2015, Disney’s Cinderella makes your dream, what you could not experience in the real world, a reality. Rebuilding long-lasting charm of a classic is a tough challenge, especially it went through numerous attempts by different directors. Disney’s Cinderella 2015 borrows some elements from its 1950 animated musical film of the same name. Even so, it also packs a heavy dose of novelty from tradition. Embraces its fairy tale roots with impressive eye candy. - Branagh makes this familiar tale feel so fresh, even though you know exactly where it's going, staging it with the full-scale splendor of a period drama rather than a bedtime story. - Nearly a century after that black-and-white cartoon short, and 65 years after a "classic" animated feature that missed the mark, Disney finally got Cinderella right -- for now and, happily, ever after. - Cinderella is a wonderfully realized family feature that retains the strengths of its source material while at the same time updating it for today's audiences. - No matter how cynical you might be -- hardened by the current climate of remakes, reboots and incessant sequels -- it's impossible to avoid getting caught up in the magic of a little Bippidy-boppidy-boo. Cinderella 2015 is more than a standard girl-waiting-for-prince tale. Many reviewers claim that director Kenneth Branagh manages a bit of revisionist magic in the freshest version of Cinderella. For those not satisfied with coming back to the theater time and again to see this Cinderella 2015 film, how about ripping this movie from DVD to TV, hard drive or portable device for preservation. Then how to rip the Disney X-project DRM protected DVD movie? Those are the four steps. First of all, to rip DVD movie Cinderella, you need to download and install a DVD ripper to break the limitation of copy protection embedded in the Cinderella DVD movie. I recommend to you WonderFox DVD Video Converter. It’s a combination of DVD ripper, video converter, video downloader and DVD/video editor. Visit the website>>. After installing, click to open it. Secondly, connect Cinderella DVD to your computer through DVD-ROM. Then click “Load DVD” button on the user interface and select the DVD drive letter (Cinderella). The final step is, if you want to keep the default values, just hit the “Run” button and wait for the output movie. Or you can customize the settings and output folder. What we need, and all we need, is returning to the beginner’s mind, and find the child's pristine pure. So stay connected with us to enjoy the best and biggest source of entertainment. This article talks about DVD Frozen and tips on how to copy DVD Frozen in the best way. If you want to know better about Frozen and get a copy of DVD Frozen, you come to the right place. Copy and backup DVD How to Train Your Dragon 2, then you can stop worrying physical damage or loss of your DVD disc.